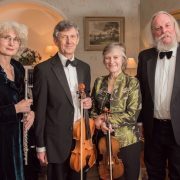 The Flete Estate revived an old country house tradition by hosting an evening of music performed by the Serenade Quartet, at Pamflete House, to raise funds for Holbeton pre-school. Through a family connection of one of the committee, the accomplished musicians, who first played together 30 years ago, agreed to organise a reunion. Their biographies included performances with an impressive line up of top orchestras, ballets, opera groups and ensembles, and teaching and examining with the associated board of the Royal School of Music and teaching at the Royal College of Music. Indeed, this ensemble would have no difficulty filling the Wigmore Hall in London. The programme included works from 17th 18th 19th and 20th century composers, some well known and some less so, and readings from Thomas Hardy and Roger McGough, among others. 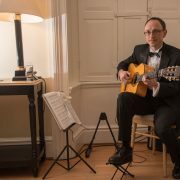 During the interval, to a gentle accompaniment of classical guitar music, Prosecco flowed freely, and tray after tray of delicious canapés were provided by two tireless volunteers and their helpers. Generous sponsorship from local businesses offset all the catering costs, and a raffle of highly desirable prizes topped off a hugely enjoyable and successful fund raising evening.